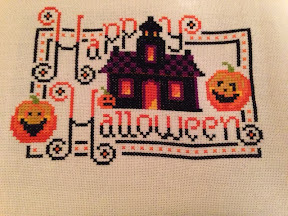 StitchyDonDesigns: Happy Halloween House 2012 and November Aims !!!! Happy Halloween House 2012 and November Aims !!!! So it was quite a successful month, although like most people I always think I could have done more and would like to be further on with my Linen butterfly project than I am. Great finish. Good luck with your goals for this month. Oh my! That fabric is amazing! Great design too. Good luck with your November goals. What a cute design Donna. 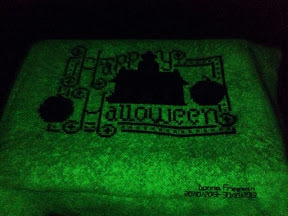 Looks great on the glow in the dark fabric. Forgot to ask - who is the designer. And Another Butterfly Finish !!! Be Warm in Your Heart finished !!! Be Warm in Your Heart !!! The Good Kind of Frog ! !